The NETcat Micro is a device that verifies the integrity of both twisted pair and coaxial cables. It uses high-speed digital technology to verify wiring continuity and check for the correct allocation of wire pairs, showing the results on a backlit display. Four durable keys select the test and wire tracing modes. 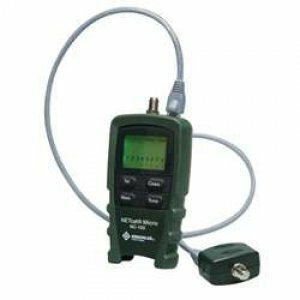 A wide range of tracing tone options makes it easy to track and identify high performance Category 5/6/7 wiring, and the tracing tones are compatible with Greenlee's 200XP noise-immune tone probe. An auto-off function helps extend battery life.